In last week’s post about the Rainbow Veggie Platter, I included a recipe for homemade hummus dip. Truthfully, I don’t think I’ve ever had any kind of hummus other than homemade. My sister makes the best hummus dip on the planet (the Creamy Hummus dip is her recipe), and the hummus served in restaurants never looked quite the same, so I’ve never tried it. I often find that store bought hummus, or that found at restaurants, looks grey and goopey compared to the homemade version. This week I decided it was time to actually buy a container of store bought hummus and test it out compared to homemade, even if it meant eating grey goop! I say all of that to give you some idea of the very non-objective attitude I had coming into this comparison, so you can take that into account when reading this post. Having never bought store bought hummus before, I was relieved to see only brand on offer at my local Safeway so that I didn’t have to decide what brand to buy! I left the store with a 9 ounce package of Otria hummus, found in the produce section. I had three testers for this comparison and we made a whole meal of two bowls of hummus, a heap of homemade crackers and some veggies. See how the store bought hummus compared to homemade below my sister’s recipe for Creamy Hummus. The recipe below is double amount from my previous post because we ate this as a whole meal instead of as part of an appetizer tray, but other than that it is the same recipe as the one on my Rainbow Veggie Platter post. 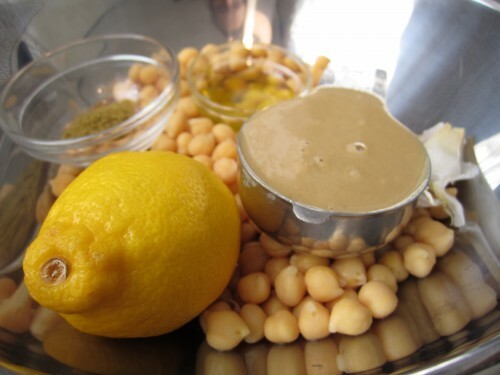 Tahini is a paste made from sesame seeds that has a similar consistency to peanut butter. It can often be found at health food stores or Middle Eastern markets but you can also buy it on amazon.com. If you don’t have tahini, I’ve heard that substituting the same amount of unsweetened peanut butter and adding a drizzle of sesame oil works, but I have not tried it myself. Place all the ingredients into a food processor or blender and process until smooth, scraping down the sides a few times. After buying my first container of store bought hummus, I was pleased to note that the ingredients looked very similar to the ones used in homemade hummus and this made me somewhat optimistic about how it would taste. However, upon opening the container and decanting some into a bowl, I became more skeptical. The hummus had a pale, super-smooth appearance that hinted at gloppy blandness. This hunch was supported by the opinions of all three of us during the taste test. The store bought hummus had a bitter, metallic flavor and the texture was slightly gummy, or “gluey”, as my sister described it. The homemade hummus also cost less than the store bought variety, coming at $1.05 per cup as compared to $2.99 for 9 ounces (slightly more than a cup). Of course, as with all comparisons, the results here could possibly have turned out differently if I had chosen a different brand of store bought hummus. So, please leave a comment if you have a favorite brand of hummus that you think would compare more favorably to homemade! 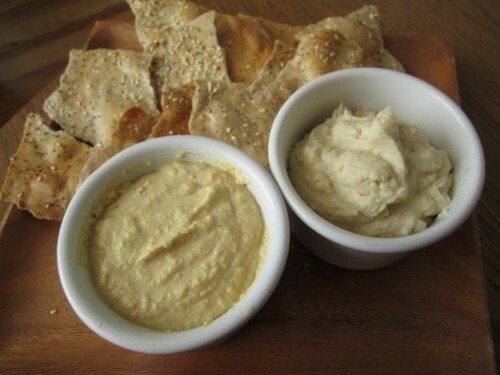 Bottom Line: Homemade hummus is infinitely more flavorful than store bought and has a more pleasing, natural texture. It is also extremely easy to make at home with only a few, relatively inexpensive ingredients. It’s definitely worth spending a few extra minutes to make hummus from scratch!